This section of Sims Drive will be reduced to one lane of traffic. 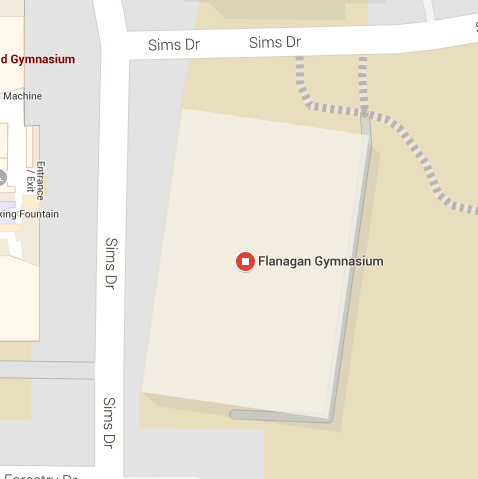 To facilitate the roof replacement on the Flanagan Gymnasium, lane reductions will be in place along Sims Drive near the gym. The contractor will be utilizing man-lifts and closing one lane of traffic with flaggers between the hours of 6 a.m. and 3 p.m. The traffic will be limited to alternating traffic as directed by the flaggers. Members of Campus Planning, Design and Construction ask for drivers to be courteous and cautious as they drive through this area. Both lanes of traffic will reopen at the end of each workday, and the project should be completed by early next week. Questions can be directed to Jack Osinski, 436-1085 or via E-mail at jsosinsk@syr.edu.